We started this Saturday of with an early morning 6k jog down to the lake. It was a great jog before the city becomes busy with people. There going to be a huge (well huge for Burlington) concert on tonight down by the lake. Every year Burlington has hosted The Sound of Music festival. It’s always been free ever since it started some 30 years ago. But this year they are trying something new with a paid event. We are opting out since it’s a whooping $70 and the bands are not great caliber. They are having a free event next week which we will be visiting. It’s a four day festival of live music, the streets are closed off and they get crowds of 100,000 throughout the four day event. It’s also NXNE next week in Toronto which is another great music festival which started as a copy to Austins SXSW. Philip will probably be going to that, I’m undecided yet. Today actually turned into one of those lazy days where not much gets done lol. Philip had some fixing to do for work which kept him busy for a few hours. I went out and got myself a new dress! 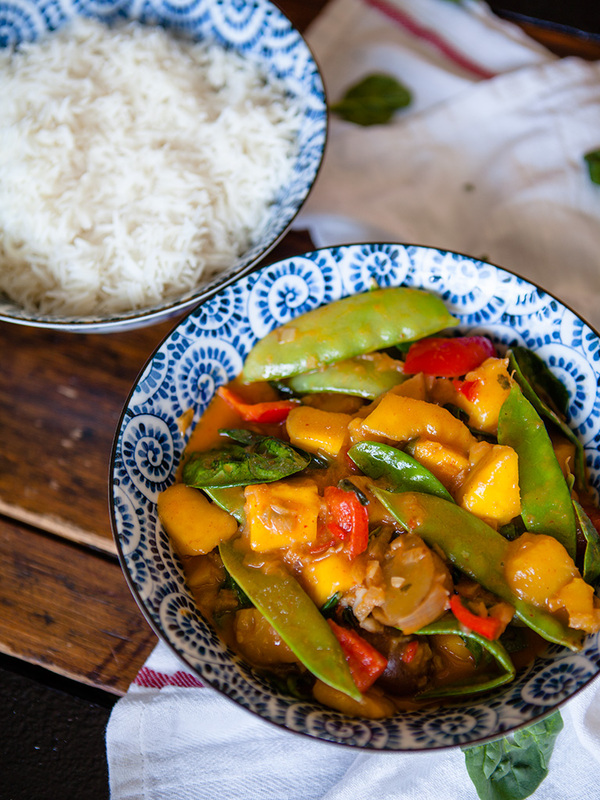 Mango was on my mind, and I had three of them in the house so they were turned into a delicious vegan mango vegetable curry for dinner. All the ingredients for this curry were in my house so it was a rather simple decision to make it. 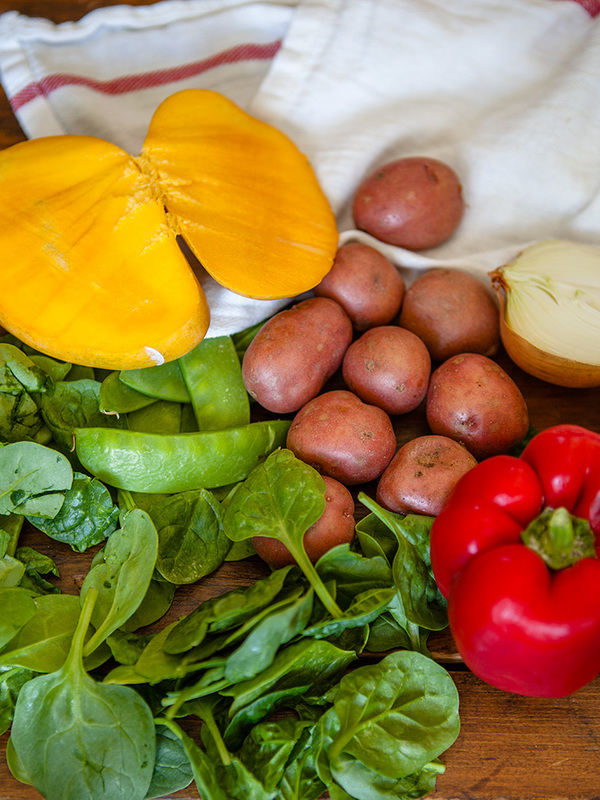 Fresh Spinach, small red potatoes, red peppers, mango and snow peas. Really simple yet great tasting. 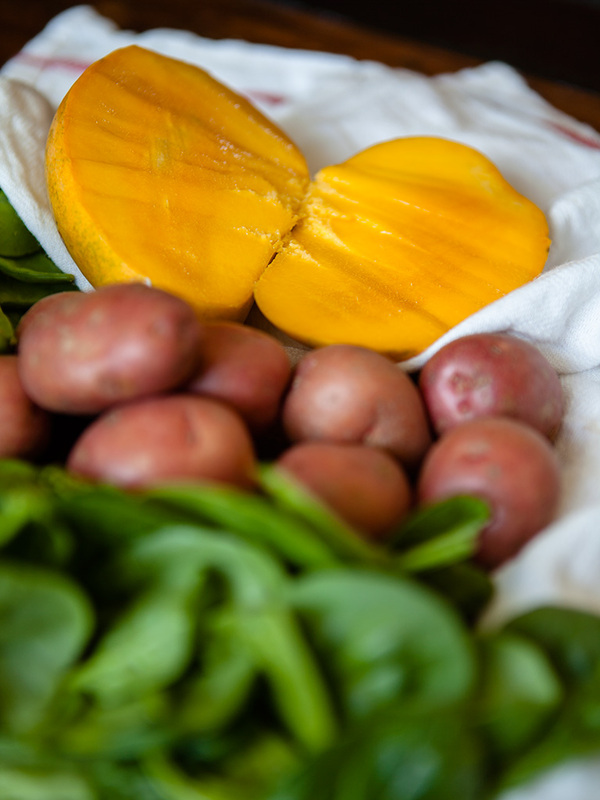 Mangoes are so versatile, they can be eaten raw, in a salad, desserts, chutneys and of course curries. 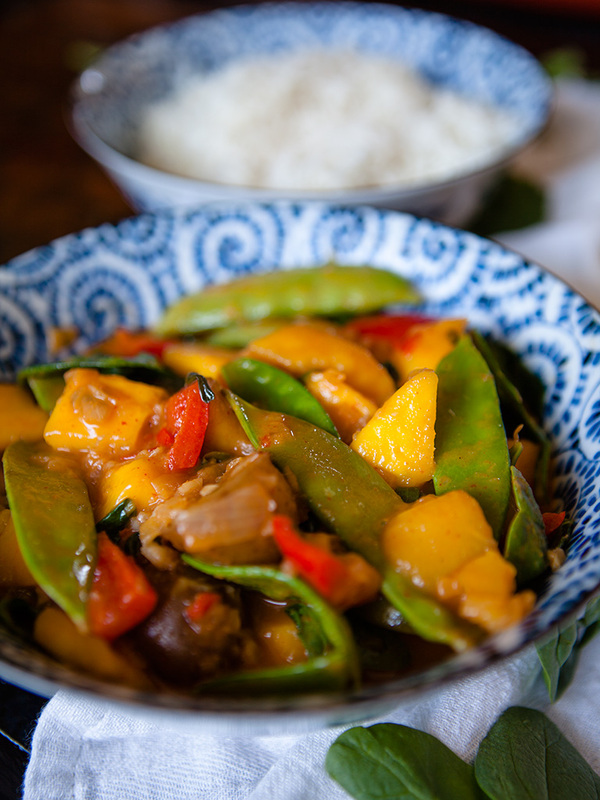 The mangoes added some sweetness to this other wise spicy dish. In this curry I do use red chilli paste, you can find the recipe here Red Curry Paste. If you don’t have all the ingredients you could use a store bought variety but be careful it doesn’t contain fish. Thai kitchen make a great tasting one. 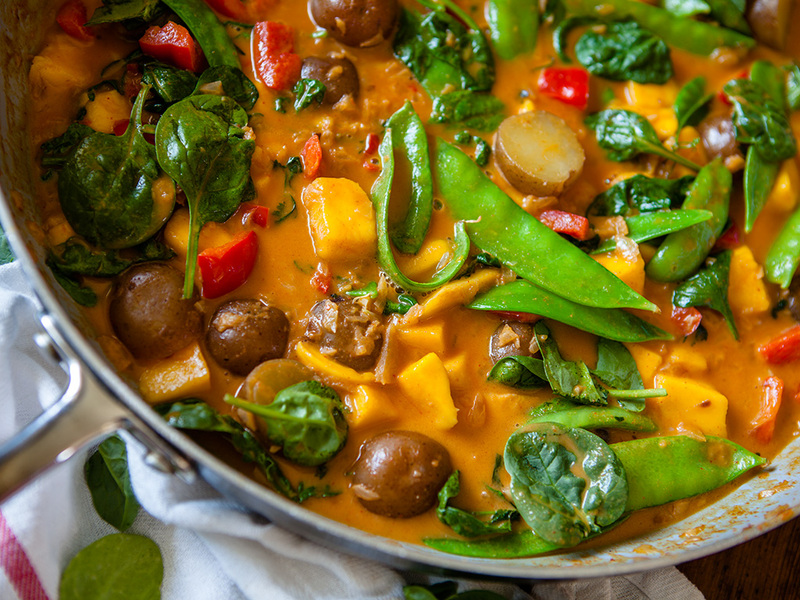 You could eat this curry on it’s own since it has the potatoes. We decided to use potatoes since neither of us really like tofu. It just adds more substance to the curry. I served it with rice as Philip really loves rice. In a small pan bring some water to a boil add potatoes par-boil potatoes for 5 minutes. Al dente. In a non sick skillet heat coconut oil. Add the onion and garlic sauté until soft. Add chili pepper, ginger and coriander coat onion until fragrant. Add red peppers and vegetable broth scraping the brown bits off bottom of pan. Add coconut milk and curry paste. Cook peppers for a couple of minutes. 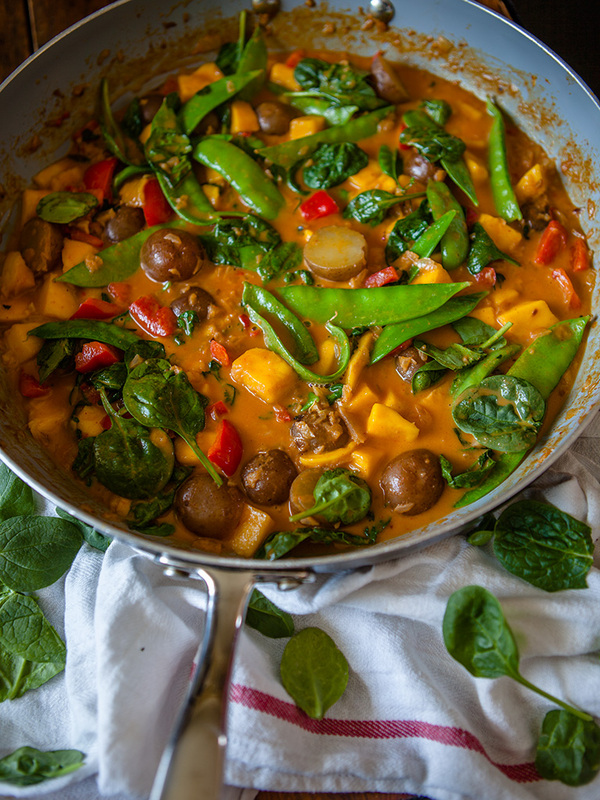 Add potatoes mango and snow peas cook until potatoes are soft. Add spinach cook until it is wilts. Serve with rice.